Trade prices on all appliances! When you are planning a new kitchen, one of the decisions you have to make is whether to go for new appliances or keep the ones that you already have. Ideally, most people would like to have new ones – maybe a big American style fridge freezer or a lovely range cooker. You might even fancy integrated appliances for a sleek, uninterrupted look. However, adding several new appliances can add a fair chunk onto the cost of your kitchen. Our autumn offer therefore could make that decision a bit easier as we are offering trade prices on all appliances on every kitchen ordered before 31st October. That could be a saving of up to 35%! That could just make the difference between having those lovely shiny new appliances to compliment your shiny new kitchen and ‘making do’ with the old ones. As the saying goes, why spoil the ship for a ha'porth of tar?! (If you’re under 30 you might need to ask your mum!). This may seem like a terrible waste, if there’s nothing particularly wrong with your appliances or they’re not too old, but it doesn’t have to be. You can sell them via a pre-used selling site such as Gumtree or Ebay and there are lots of selling sites on Facebook – what you get for them could be spent on some new knick knacks for the kitchen! If you’re not too worried about making a bit of cash for them you could donate them. Many charities will take them (and some will collect) or there are schemes such as The Furniture Re-use Network (FRN) who distribute them to people in crisis who need them. So they don’t go to waste and you spread a bit of goodness in the world! So, are you looking for a new kitchen right now? Take advantage of this great offer while it’s available. 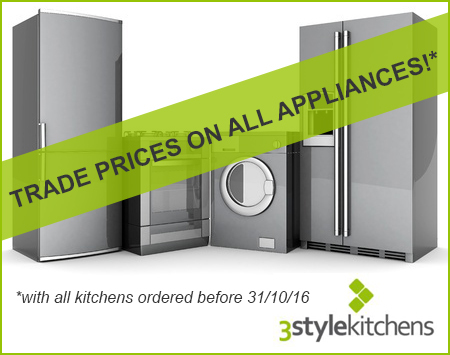 To get your appliances at trade prices you need to order your kitchen by 31st October (Halloween may not be the only scary thing if you miss the offer!). The added bonus of ordering by the end of October is that you should have your brand new kitchen (and lovely new, discounted appliances!) fully fitted and ready to go for Christmas (bad news is you’re definitely getting Christmas dinner duties then!). It’s best to get the ball rolling sooner rather than later as it can take a while to create the perfect kitchen design so get in touch to arrange a consultation and we’ll take it from there. Call 0800 321 3491 or complete our online form. In the meantime why not browse our galleries or catch up on design tips from our Kitchen Trends series? 0 Responses to "Trade prices on all appliances!"